Electronics components are the major part of the electronics system design and are rapidly undergoing technology advancements both, in performances and sizes. Obviously, the successful companies and products have utilized 'smarter' components in their designs. The method of choosing such "smart" components thus becomes "an art" to be acquired by the engineers today. It appears as if the process of component selection for the hardware design requirements is very simple and straightforward but indeed there are many considerations and "techniques" involved behind. An error made in the component selection can cause serious damages up to an extent of thrashing and disqualifying the entire design and the product. So, utmost care and precautions are advisable while performing this activity. Hence in most of the organisations, a dedicated team of component engineers are formed to help the design teams. The component engineers need to have the breadth of knowledge and experience in the fundamental understanding of components, their specifications, constructions, and functionalities. The component engineer is the one who is approached for the selection of components and suppliers since he acts as the liaison between sourcing/supply chain, design and, manufacturing teams as well as strengthens the supplier relationship. Choosing the right component is the most important task involved in the product development cycle because a wrong selection here creates heavy and unpredictable losses (money, machine, men, time, etc.,) throughout the development activities causing failures and delays in the product releases. Even though the technology advancements, e-commerce and globalisation have made the engineer's life easier, the human interference and intelligence are still very much essential in one or the other form. Utilizing the web-based parametric tables and other user-friendly methods to select a component is easy but one should know how, when and where to use them appropriately. There are reference component databases available in the market, both free and subscription-based. However, these databases may take the engineer to the nearest set-of-components but choosing the best one that suits the design is still the selector's task. There are various parameters such as electrical, mechanical, environmental, cost, reliability factor, availability (life cycle), etc., which should, at a minimum, be considered while selecting a component. Component selection is a process of selecting a suitable component or a set of similar components from different suppliers for the designed circuit to perform its intended operation. The component engineer may have to first understand the circuit functionality or has to get the exact parametric values with the permissible tolerance levels for each parameter from the design engineer. The component engineer has to volunteer in gathering as many details as possible from the design engineer in order to speed up the component selection. Most of the times, the design engineer invariably provides the list of critical parameters alone, but for the component engineer, the other non-listed parameters are also critical. Hence it's important for the component engineer to query the design team even for a small doubt and not to guess or consider the attribute values for granted. The component engineer should also consider the "underlying factors" or the "competitive edge" of the component when compared with the nearest competitors. Due consideration should be given to the affordability - a factor that guides the company to prefer an expensive component to avail the additional features, become more competitive and reap the most out of the investment made. Here a line of compromise is drawn and compared between the investment made and the return on the investment while choosing the technology-based competitively-edged components. Mere choosing the right component is just not sufficient for product development but to track and control every component's specifications throughout the supply chain and the product's life cycle is also significant. Many companies implement part-specific and product-specific specification control documents which are updated as and when a change is made with respect to the part or the product. These changes can be due to external factors such as the component manufacturer releases a product or process change notifications that affect the component's form, fit or function; manufacturer mergers and acquisitions; plant or factory relocations; alternate fabrication sites; etc., and internal factors such as preferring alternate part or supplier or distributor; changes made in the design boards; inclusion/exclusion of circuitry or components; changes in the test parameters; etc., Even the component's end-of-life (EOL) period is tracked in this specification control document. 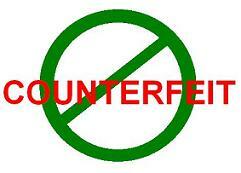 Hence, the traceability factor can help the organisation to mitigate component risks easily and proactively. The life cycle of the component is yet another attribute that should be focused while selecting a component, its more relevent in case of semiconductor IC chips. The predicted life of all the components inside the product constitutes to the life of the product itself in addition to the other variables. The present 'availability' factor of the component is important, but how long the component is going to be available in the future is much more important. The designs and products end up costly because of their improper selection of components. Selecting a component which is near to end-of-life is an added risk or an overhead to the company and choosing a component which was just invented (just born) is risking with the component's survivability itself. So, wise judgement that promotes the usage of the low-risk, long-life components in the BoMs (bill of materials) should be taken. To mitigate the component's unpredicted risks, one should always maintain a list of alternate components and sources. More details about the component's life cycle management are presented in a separate module. Many organisations invest lot of efforts and money due to component's unavailability and obsolescence issues. "Better be prepared with alternate components' list than to struggle with odd and costly situations". The next important aspect to consider is the "reliability" of the component which is termed as the chance of the component to perform its planned function for the specified time interval under the defined conditions with a given confidence level. To put it simpler, the reliability of a component is the quality of the component's performance over a period of time. The amount of time period where the failure rate is constant is the useful life period of the component and usually the component's reliability is provided in reliability % or MTBF score or failure rates. The popular three methods of predicting component's reliability are PRISM (217+ method), Telcordia (Bellcore method) and MIL-HDBK-217. The component's reliability helps the design team to verify the design's ability to meet its objectives early in the development stage. Also, the reliability factors helps to calculate the warranty and safety durations as well as perform decisions on design substitutions. Having understood the generic factors such as component's availability or the life cycle, affordability or the feature-rich expensive selection, traceability or the component's history log and the reliability or the quality of the component's performance over a period of time, let's go through few important technical parameters. Technical parameters, for our understanding, can be classified into electrical, mechanical and environmental. 1. Electrical parameters are the ones which directly dictate the functionality of the component. Each component category has its own primary specifications rated and designed for. 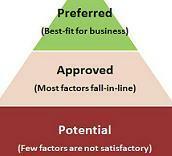 There are few specifications which are category-specific and few others are generic in nature. For example, operating temperatures, voltages, etc., are almost applicable for all the component categories and hence are generic in nature. Whereas examples like capacitance value, memory width, cut-off frequency, etc., are applicable to few specific categories only and hence these attributes are category-specific attributes. 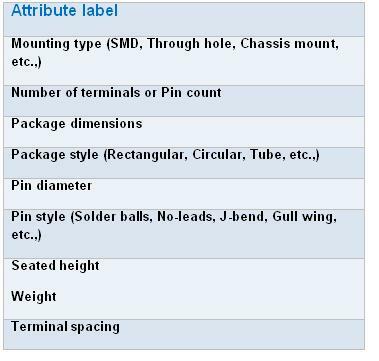 The table below is a reference of few categories and their key electrical attributes' list which helps in searching a component in its respective category. Certain parameters should be given due consideration and these parameters depend upon the end application of the product. The end-application can vary between military, commercial and industrial purposes. Weather withstanding capabilities of commercial grade devcies are not so good as industrial grade and the military grade devices withstand extreme and extended conditions that the military products operate with. The extended temperature ranges, thermal shocks and vibrations, humidity and moisture tests, dampening tests, etc., are few parameters to be considered carefully. Also, there are many manufacturers who qualify their components to military standards and exclusively trade those components as MIL-qualified components. Be-aware of the difference between MIL-qualified and tested as per MIL-standards. 2. Mechanical parameters are the ones which indicate the physical form, mounting styles, size and weight of the component. These parameters can be felt or physical in nature. These features decide how the component connects with other components in the circuit board. 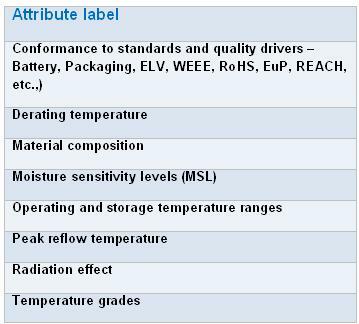 See the below list of mechanical attributes list which can be suitably considered while choosing the component. It's very important to have prior information about the physical dimension and mechanical specifications requirements from the design team because almost many suppliers have the same functional component in more than one package styles. The ordering information would definitely vary with the package styles and hence choosing the right package code is vital. 3. Environmental parameters are the ones which are related to the component's behaviour and ratings with respect to the different environmental conditions. Extreme environmental conditions are simulated in the lab for test purposes and that's how the component's ratings are measured. In addition, there are regulatory authorities governing the ban or the restricted use of certain hazardous substances in the components thereby providing instructions to the manufacturers to comply with these regulations in order to perform the business in the specified countries or markets. The list of important environmental attributes is given below. Above all, one should not forget about the new requirements posed by the environmental regulators worldwide. The new regulations may require suitable evidences in the form of IPC-1752 material composition declarations, test reports, RoHS certificates, certificates of conformances (CoCs), custom-declarations, etc., Without these evidences, it's very risky and dangerous to consider or use the related component in the designs and perform business in that particular region or country. However, there are certain exemptions permitted with respect to few substances, their permissible usage and applications in which the selected components get in. The packaging preference is another parameter to consider in selecting a component. The presence of different manufacturing or board assembly methods and feasibilities necessitates specific flow of components in the production line. The flow of components depends on the type of packaging or shipping method used. Packaging is the method of placing the components in an order which is suitable to be picked up one by one automatically by the computer-controlled machines in the manufacturing or assembly plants. So, components usually are delivered in tape and reel, bulk, ammo packs, tubes, and boxes. Choosing the right packaging method simplifies the assembling or soldering activity. Of course, there may arise one or the other form of supply chain constraints such as counterfeits, obsolescence, long lead times, minimum order quantities, extra cost for preferred packaging and quantities, logistics and warehouse issues, free samples, lot rejections, damages, sustainability, vendor compliance, etc., during the selection and qualification process. With the help of cross-functions and previously made agreements, these issues can be solved on a need basis and more details are presented in the "Supplier selection" module. Hence, the role of component engineers is so valuable and productive in the supply chain…! 1. Try to maintain the company-wide "preferred parts list" (PPL) - a list that contains pre-qualified components list where component and supplier evaluations are conducted and passed. This list should be a controlled database (even an MS-Excel can work as a controlled database) and only designated authority should have editing permissions. Always, give 1st preference to select the components from the PPL for new or existing designs. 2. One should not come to a conclusion or select a component by just glancing through the main description given at the top of the datasheet. Go through the datasheet thoroughly and evaluate for the electrical parameters given by the design team. 3. Make a list of critical components in the designed circuitry and possibly try to conduct piece part reliability predictions and test the samples accordingly. 4. Ensure effective supply chain processes are in place and practised in order to control the redundant and duplicate components dwelling in the inventory. 5. Emphasize to re-use existing component as much as possible - so that intangible benefits can be ripened. 6. Standardize the component descriptions in the component database or the PPL (if maintained) - has the magical ability to deliver so many options for a variety of purposes in the supply chain….! 7. 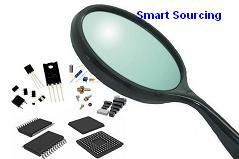 Prefer to select a component from the approved list of manufacturers or suppliers. Practically it's hard to find all the components required for the design from the given list of approved/preferred suppliers. In this case, it's better to perform vendor or supplier qualification and to have a process incorporated to monitor and evaluate the deliveries made by the non-preferred suppliers. 8. Selection of parts should be mature enough to satisfy a wide range of design applications - hard task right…? That's the reason why this writer called it's an art to acquire. And lastly, update your knowledge with the latest trends, technology advancements, industry regulations and dynamism in the market with respect to your field of operation. Part1:Smart component sourcing is about green, clean, rugged, and the $:The basics of modern component buying methodologies are explained in these series of articles. Hi Graciela Kravtzov , Thanks for the feedback on missing table. Its now inserted. .
Hi! The electrical parameters table is missing in the above article. Could you please update it? Thanks!. Hi! It looks like the electrical parameters table is missing in the above article. Could you please include it? Thanks! .